Contact the Physician’s office within 2 hours to let them know if the prescription is accepted by AccuServ Pharmacy®. Provide timely completion of prior authorizations and work with drug manufacturers and non-profit organizations to find your patients the lowest possible copays. Physician offices and patients are notified of the status of the prescription throughout the Prior Authorization and Financial assistance process. After AccuServ receives approval of the prescription, we will contact the patient to set up delivery and answer any questions they may have. Once the patient receives their medication, an AccuServ team member will review their medication with them, and provide helpful resources on side effects and how to manage their condition. AccuServ will continue to work with the patient during therapy to help maintain adherence. From our specialized packaging, to refill reminders, we do our best to make sure managing medications is simple. At AccuServ we help make it easier for patients to take the right medication at the right time, every time. Our AccuPac® packaging allows our patients and family caregivers a simple way to manage even complex medication regimens with confidence. AccuServ employees are experts at obtaining maximum coverage for our patients and working through challenging reimbursement issues. 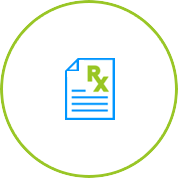 We manage your Prior authorizations and work with drug manufacturers and non-profit organizations to obtain the lowest copays possible.